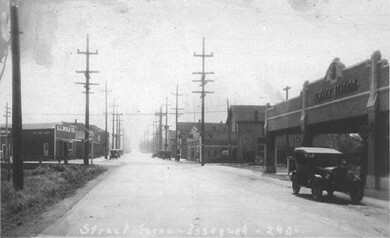 As we stand at what is now the intersection of First Place Northwest and West Sunset Way, we are looking east towards Front Street in this 1924 Mill Street view. On the left is a vacant lot where the new library is under construction. Behind the second power pole on the left is the Andrew L. Wold Co. building, and in front of the pole is the railroad crossing sign marking the tracks across the intersection leading to the coal mines on Mine Hill Road. The tracks were abandoned this year, but were not removed until many years later. On the right is the Red Crown Service Station (now the Rogue Issaquah Brewhouse). Street parking, including enforcement, were not a problem as indicated by the few cars on the street and the one in front of the service station facing the wrong direction.